Grace Cossington Smith knew it was an advantage not to have to work. Unhurried by economic need, unflustered by an applauding public, she could wait until the moment was right: ’I only paint when I want to’; ’When I do paint it is something I want to do’.1 Still life was then a rather debased genre, which needy and untalented painters were inclined to seize upon for lacklustre productions and renowned artists too often used as an opportunity for parading their skill. For Grace Cossington Smith, however, still life and interiors (a form of still life) involved the stiff challenge of shaping the familiar world for an elemental experience. Throughout Still Life in the Window there is both a modeller at work and a colourist. Cossington Smith, who had experimented with sculpture and could readily turn her hand to carpentry, had a sculptor’s sense of three-dimensional form. With the exception of the window in the upper right, the image is formed of layers of cloth which are so complexly and restlessly draped, folded, tugged, pouched and pushed as to completely lose the forms of wall and table. Whirlpools of cloth ridge around the fruit and push back against the drapery’s impetuous fall from above. By contrast to the decisively-modelled topography, the fruit is not modelled at all. 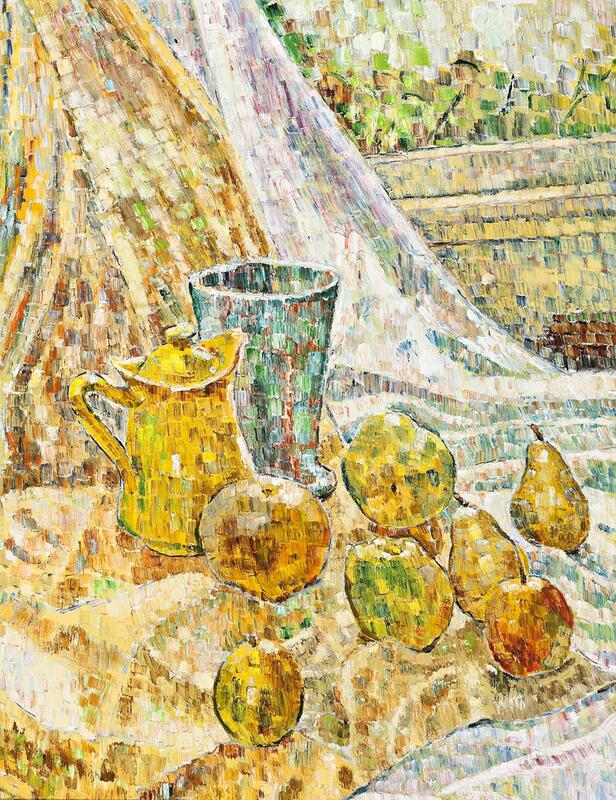 This is where the modeller gave way to the colourist, who excluded cast shadows as ‘superficial’.4 Instead, here, she has encompassed each piece of fruit and the jugs with a discontinuous, fine dark line within which the colour has intense and vibrant life. The brilliant effect is more Sainte Chapelle than the traditional love apples with decay already at work within their flesh. The fruit radiates light. It is as light as air. 1. Cossington Smith, G. interviewed by de Berg, H., Sydney, 16 August 1965, National Library of Australia, Canberra. 3. Thomas, D., Grace Cossington Smith, Art Gallery of New South Wales, Sydney, 1973, p. 6 quotes Cossington Smith’s statement that it was her aspiration to paint ’colour vibrating with light’ and ’the relation of forms to each other’. 4. Interviewed by Alan Roberts, Sydney, January—April 1970, transcripts p. 20. Hart, D., Grace Cossington Smith, National Gallery of Australia, Canberra, 2005, p. 90. Deborah Hart kindly discussed with me Cossington Smith’s approach to painting, and lent her copy of the transcripts of Alan Roberts’ four excellent interviews.